The event consisted of 2 solo and group photography sessions in the morning and afternoon and handshake session. Members wore different costumes for the morning and afternoon photo sessions. To participate the event. 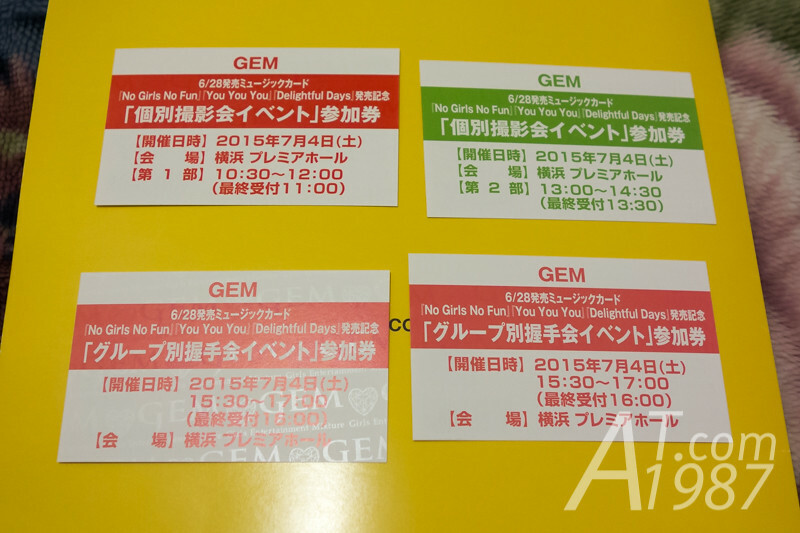 The tickets which could be get from buying the set of goods and No Girls No Fun, You You You and Delightful Days singles. These singles was only sold as MU-CA card. I couldn’t buy the group photo sets because they’re sold out. However I could get 1 morning solo photo set, 1 afternoon solo photo set and 2 handshake sets. Since these singles were released on the time I was in Japan. (The 28th June.) So I told Avex online store’s mu-mo to send them to the hotel directly. For those who want to do like me, make sure your hotel if it can accept the package for you or not. 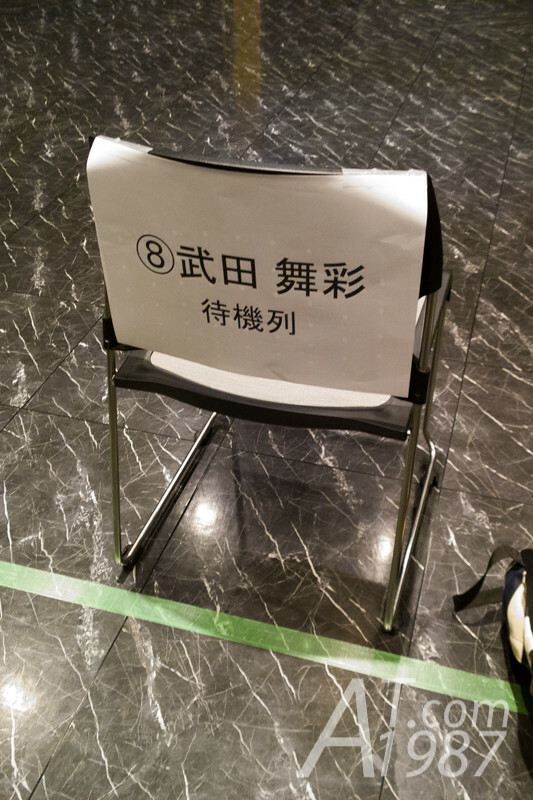 The event took place at Premiere Hall on Premiere Yokohama. 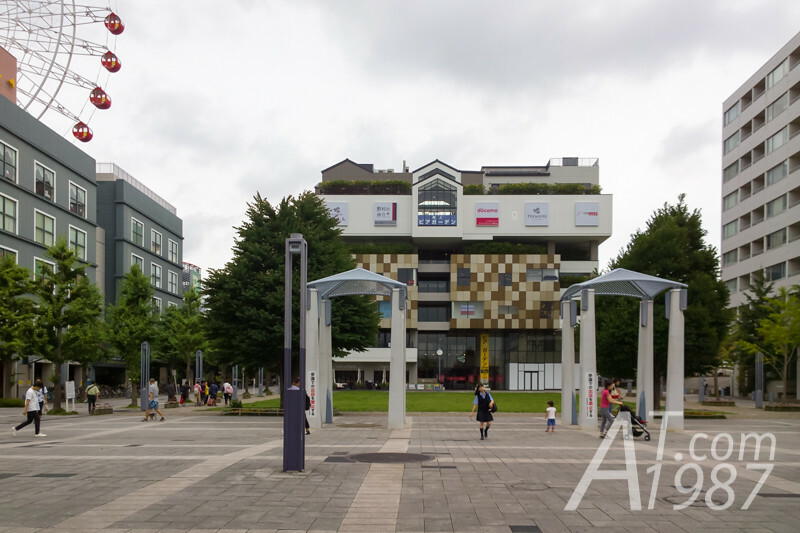 It is next to Center-Kita Station of Yokohama Municipal Subway. From my hotel in Minami Senju, I took Tokyo Metro and Tokyo Toyoko Line train to Hiyoshi Station where I took the subway green line to my destination. The trip took about an hour. 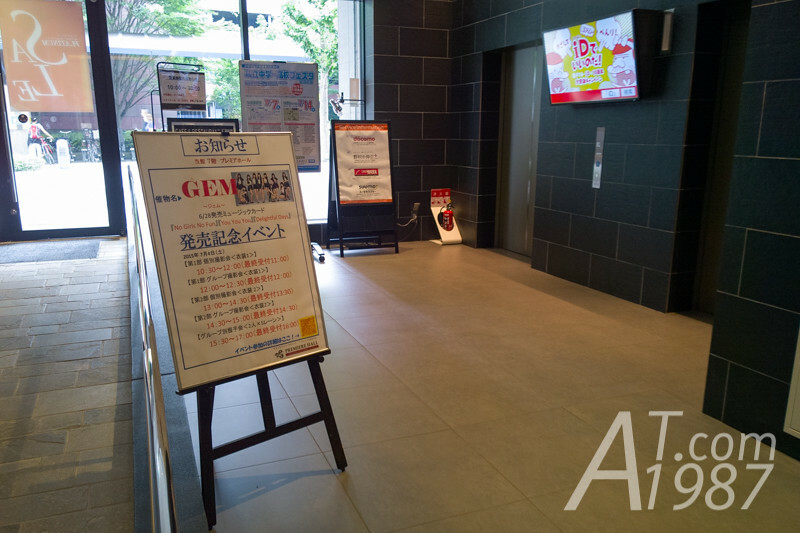 A sign board telling about the event was on the first floor. I got on an elevator to 7th floor for Premiere Hall. I saw other attendants waiting outside the hall on the 7th floor. About half an hour before the 1st photo session event staffs went from the hall told us to enter the hall. 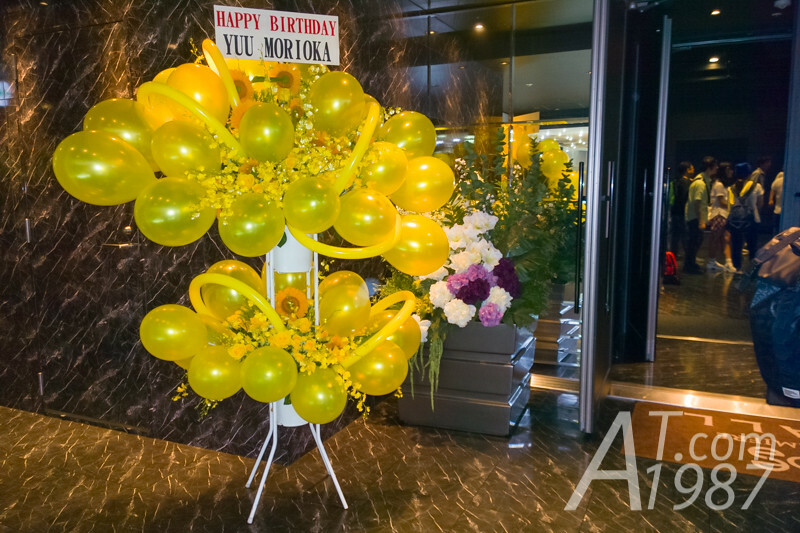 There were a goods selling table and flower banquet for celebrating Morioka Yuu’s Birthday at the foyer. Inside the hall I saw 8 queue lines for taking photo each members. I chose Takeda Maaya who is the group center at that time. (She is now on hiatus to study in USA.) I needed to check her name in Kanji to make sure I was in the right line. Since this was my first time. I asked the staff about the process of taking photo while I was in the line. I learnt from the staff and attendant in front of me that I could choose the camera to take my photo between my own mobile phone and the event’s Instax camera. Then the staffs would use it to take a single photo of me and chosen member. When my turn came. I handed a ticket to the staff and explain her how to use my phone to take a photo. I also asked if the member can do the pose I want or not. After I made a preparation with her. Now it’s time to take a photo with Maya. When I met Maya. I first introduced myself. 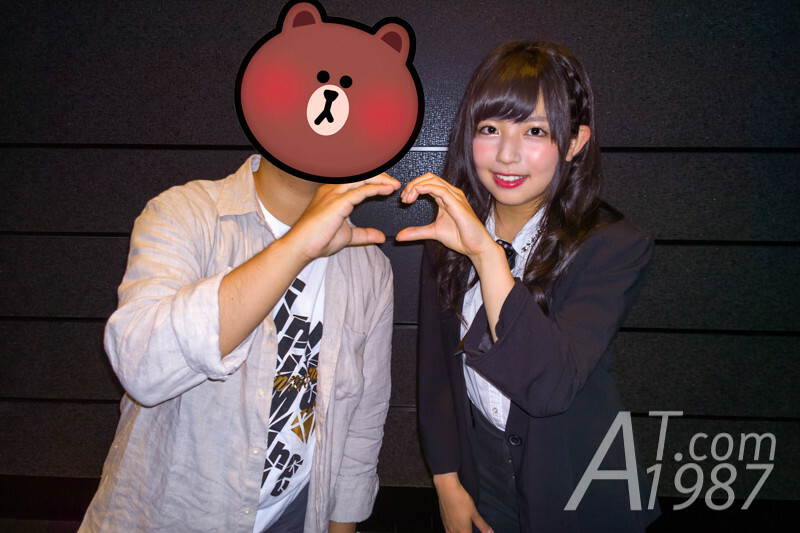 She’s looked happy like usual idol then confirmed to do the heart pose with me. (I think she heard my conversation with the staff earlier.) The staff then took a photo of us and let us checking it. If it wasn’t OK, we could ask her to take a photo again. The photo is very good taken. (I noticed the staff who took this photo may be the one who record members’ activites video which makes her to have a good skill.) However I forgot to smile. I could ask the staff to take a photo again but I didn’t do. Because I was afraid the next photo might not as good as the first one. I stayed in the hall to backup the photo to the cloud storage. While I was waiting, I saw how other members were in real life. I saw Ranachin like to be active. She danced while waiting the attendants. Macho loved to play prank with staffs. When my upload’s finished. I left the hall to have the lunch before an afternoon photo session began.